By now, most people around these parts expect that the Moose Jaw Warriors are going to make a run at winning the Memorial Cup. That's not to say that every team isn't also making a run at it, it's just that Moose Jaw has all the tools and skills typical of past WHL champs and Memorial Cup winners. They've got a fantastic offence: led by the likes of Jayden Halbgewachs, Brayden Burke, Tanner Jeannot and Brett Howden. They have solid scoring right on down to the third line. Guys like Tristan Langan, Justin Almeida and Ryan Peckford have shown themselves capable of fitting in almost anywhere on the team. Their defence has been excellent all season, but just recently, with the deadline deals that brought in Kale Clague and Brandon Schuldhaus, they became the toughest defensive team in the league. Add to that, Jett Woo and Oleg Sosunov and it gets real easy to forget that Dmitri Zaitsev and Josh Brook are also on this team. This Warriors club has top-line defenders, six deep. Plus, Brody Willms has been consistent between the pipes all season. He trails only Logan Flodell, from the Lethbridge Hurricanes, in wins by a goaltender. The 2017-2018 Moose Jaw Warriors have been spectacular and anybody with an ounce of knowledge about minor league hockey realizes how difficult it will be for any other team in the West to defeat these guys. With a record of 36-7-1-2, they are, without question, the odds-on favourites to represent the WHL in the 2018 Memorial Cup, which is being held in Regina. Tanner Jeannot and Jayden Halbgewachs celebrate one of their multitude of goals. The odds look good. But it's still a tough road to win the Ed Chynoweth Cup and an even tougher one to win the glorious Memorial. Braylon Shmyr leads the Saskatoon Blades into a Playoff they have little chance of succeeding in. They will most likely have to meet the Saskatoon Blades, who have played well against the Warriors this season. One of the few teams who has beaten them, in fact. But I have a hard time seeing that success transfer over to the playoffs, where they will be playing an even better, even more physical Warriors team than was the team they beat. The addition of Kale Clague will be too much for them to overcome, especially considering just shipped two of their top dawgs off to the Regina Pats. Outside of Braylon Shmyr though, the Blades just don't have the fire-power to compete with the Warriors. I'm calling the Warriors in 4. In round two, they'll most likely meet up with the winner of a Lethbridge-Brandon showdown. Brandon dealt us their biggest star in Clague, and seem to have resigned themselves to the fact that they don't have enough skill to get through the meat-grinder that is Moose Jaw, Swift Current and Regina. They also shipped Tanner Kaspick to Victoria in exchange for some youth. They've given up on this season, but should have a pretty strong club in the years to come. They've still got Ty Lewis, Stelio Mattheos and Logan Thompson in net, and I think that's enough to guide them past Calen Addison, Jordan Bellerive and the barely plus-500 Lethbridge Hurricanes, but on account of Moose Jaw manhandled Brandon even before the trade deadline, I'm calling another 4 game sweep, regardless of who they play. Glenn Gawdin is the heart and soul of a very impressive Swift Current Broncos Club. Here is where things get tough. Moose Jaw either plays Regina or Swift Current in round 3. Regina doesn't have the greatest record, but did some deadline re-building and has a legitimate cup contender now. But, Regina is already hosting the Memorial, and is therefore guaranteed a spot; I think that means more to them than winning the Ed Chynoweth. That, added with the fact that Swift Current will have home-ice advantage and they are still just a better hockey club tells me Swift Current beats them in a tough series. I figure in six; but for the Warriors sake, it would be nice to see them beat the tar out of each other in a grueling seven gamer. Swift Current has had Moose Jaw's number for a few years now. They upset the Warriors in game seven of a fantastic 2017 playoff series; and they've beaten them on multiple occasions in this season as well. Swift Current is the biggest threat to Moose Jaw's supremacy in the WHL, and they did almost as much deadline shopping as the Warriors did to prepare for a long run at some cups. Before the World Juniors, Swift Current were neck-and-neck with the Warriors at the top of the standings and they had the two top scorers in the league. Aleksi Heponiemi and Tyler Steenbergen. Heponiemi played for the Fins and Steenbergen became a household name when he scored the gold-medal game-winner. Moose Jaw really capitalized on them being away from the team. Halbgewachs and Burke surpassed them both in scoring and the Warriors were able to wedge a valuable six points between them, but Heponiemi and Steenbergen are back, and the Broncos know exactly why they trail by as many points as they do. The Broncs made some deals recently that will add a boat load of depth to their offence. They picked up Giorgio Estephan, Lethbridge's top scorer and Matteo Gennaro, the top guy from the Calgary Hitmen. Plus they've got Glenn Gawdin, who is their leading scorer. He has been the heart and soul of this team for four seasons now, and is about to surpass both Joe Sakic and Shelden Kennedy on the Broncos all-time leading scorers list. Offensively, Swift Current is every bit as strong as Moose Jaw, and the addition of Stuart Skinner, also from Lethbridge, in net means they've actually got stronger goal-tending than the Warriors do. But where I think Moose Jaw wins this series, is on the defensive. As I have said, Moose Jaw is six man deep, defensively. The same can't be said about Swift Current. And that's not to knock on their defense; because it's still pretty good. Colby Sissons is great, but he isn't Kale Clague. Artyom Minulin, the big Russian, is fantastic, potentially even NHL caliber, but he isn't Oleg Sosunov. And Sahvan Khaira, whose brother plays for the Edmonton Oilers, is pretty sturdy too, but, if you're talking Asian persuasion, he's no Jett Woo. Then outside of those three guys, the Broncos have nothing that even comes close to matching up with Zaitsev, Brook and Schuldhaus. That's gonna be a tough series, but health and depth play to Moose Jaw's advantage more than they do to Swift Current's. I'm calling Moose Jaw in 7, followed by a huge celebration on River Street. Because once they get finished with Swift, the competition becomes noticeably softer for the WHL Championship Series. Carter Hart is the best junior goalie in the nation, as he proved in the World juniors. Alone, he has the ability to win games. It's hard to tell who they will be up against for the Ed Chynoweth. Kelowna, Vancouver and Victoria are neck-and-neck in the B.C division and the U.S division is led by Everett and Portland. These are all teams that your current Moose Jaw Warriors, barring a string of costly injuries, should be able to defeat in five or six games. Hell, the momentum from beating Swift Current could propel Moose Jaw to a four game massacre, but I don't want to sell those west coast teams too short. Any one of those five teams could win their conference, they are all that close. But if I were forced to put money on one, it would be the Everett Silvertips. They've got Carter Hart in net, he looked spectacular as he led Team Canada to gold. We know he can play under pressure and at the highest levels. The kid is gonna be a star one day, and I can see his performances alone winning games. They've got a few great goal-scorers too, Patrick Bajkov will end this season as the team's all-time top point scorer. Plus Matt Fonteyne and Kevin Davis have had no trouble finding the back of the net. However, a series with the Victoria Royals would be nice, if for no other reason than to play against Warrior alum Noah Gregor, who was traded earlier in the season for Ryan Peckford. I always liked that Noah Gregor. If it's Everett in the finals, it will take Moose Jaw six games to get past the goaltending, but if it's any other of those teams, the Warriors will win in four or five. 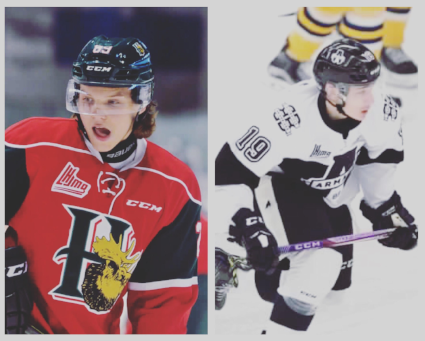 One of many teams could come out of the QMJHL, but the two teams leading the pack right now are the Halifax Mooseheads and the Blainville-Boisbriand Armada. Pictured here are Otto Sompi (left) and Alex Barre-Boulet (right). With the Warriors in the Memorial Cup, they will practically have home-ice advantage, on account of the tournament being played in Regina. But they're gonna have to play Regina there too though, that can't be forgotten. With home ice and a rebuilt, possibly well-rested squad, the Pats won't be easy. But then again, none of the games, at that stage, will. It looks like the Sault Ste. Marie Greyhounds are a lock from the OHL. I mean, anything can happen between now and the end of the season, but, at 37-3-2-1, it looks as if there isn't a team in Ontario that could roll with them in a seven game series. Plus, at the trade deadline, they added Team Canada gold-medalist, and previous Memorial Cup runner-up, Taylor Raddysh to the mix, so they're even better than their record attests. Out of the QMJHL (Quebec Major Junior Hockey League), it's a little less cut-and-dry. The standings are a little closer and there isn't one team dominating the league. It could be anyone of either the Rimouski Oceanic, the Rouyn-Noranda Huskies, the Blainville-Boisbriand Armada, the Halifax Mooseheads or the Drummondville Voltiguers. But, of those five, I think it's most likely that Blainville-Boisbriand gets through. All the Warriors have to do to make it out of the Round Robin phase is not get last place. So that means they have to win one game out of three, at the very minimum. Well, they haven't lost three in a row yet this season, so I don't imagine that will change in the Memorial. Matt Bradley leads the Pats in scoring. Let's just predict that the SOO win the group stage and either Regina or Blainville-Boisbriand (or Halifax, or whoever it is) gets eliminated. That will leave Moose Jaw to battle it out against the better of those two. On account of Regina is guaranteed a place in the tournament, I think it's safe to say they have better odds of making it into the semi's than any one particular team out of the Q. That means Moose Jaw meets Regina, at the Brandt Centre, again. Only this time with even more on the line, in an all-or-nothing, loser-goes-home, battle to the death. Come on, let's be real, Sam Steel, the Team Canada gold-medal winner, is a pretty special talent. So is Matt Bradley and Josh Mahura, so is Jake Lechyshyn. And Adding Hebig and Hajek was massive. It was enough to get them into the semi-finals of the Memorial Cup. But it's not nearly enough to beat this Moose Jaw team when it counts the most. And if you've made it this far into this story you know it too. The Sault Ste. Marie Greyhounds have been nearly unbeatable all season, and they became even stronger at the trade deadline. It wouldn't be fair to write this feature and not anticipate having to play the Sault Ste. Marie Greyhounds at least once. The SOO are the top junior team in the country, and have been nearly unbeatable the entire season, and they only got stronger at the trade deadline. They've now got three Team Canada gold-medalists: Raddysh, Boris Katchouk and D-man Conor Timmins, and none of them are even the team's top point scorer; because in that spot they've got Morgan Frost, who actually leads the entire OHL, and is soon to be an active member of the Philadelphia Flyers. Plus they've got Tim Gettinger and Barrett Hayton who both score a ton of goals. To go with Timmins on defence, they've got the OHL leader in plus/minus, Rasmus Sandin and Mac Hollowell, who are both probably going to spend some time in the NHL. And don't forget their goaltending. Matthew Villalta has the best save percentage in the OHL; and this is a guy surrounded by the best offence and the best defence. It's not hard to see why these guys keep winning. But, hey, you gotta beat the best to be the best; right Warriors?